Ken Walker, “A Legacy of Faith” Charisma (February 2010), pages 24-28, 54. In January 2010, Christianity Today featured an online discussion about organic church starting off with a “Soulwork” column by senior managing editor, Mark Galli. This was followed by online responses. J. I. Packer and Gary A. Parrett, “The Lost Art Of Catechesis: It’s a tried and true way of teaching, among other things, Christian doctrine” Christianity Today (March 2010), page 26. Does your church struggle with instructing new believers in central biblical beliefs and values? Did you know that catechism has a long and successful history of grounding Christians in the basic tenets of their faith? James K. A. Smith, “Whose Rome? Which Catholicism? A Review of Beckwith’s Return to Rome” The Other Journal 17 (2010). Jamie Smith reviews Francis J. Beckwith, Return to Rome: Confessions of an Evangelical Catholic (Grand Rapids, MI: Brazos Press, 2009) in Mars Hill Graduate School’s The Other Journal, to which Beckwith responds to at length in his blog. Author and theologian Tony Jones was invited to present a paper at the 39th annual Society for Pentecostal Studies convention that was hosted by North Central University, an Assemblies of God school, in Minneapolis, from March 4-6, 2010. Jones’ invitation and his participation in the annual meeting became a point of contention for some Society leaders, meeting attendees and denominational leaders. 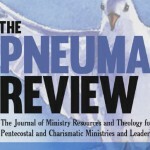 The Pneuma Review editors (two of whom attended the meeting) recommend reading Tony Jones’ blog which gives his side of the story while including responses from numerous meeting participants and organizers.